According to Mundo Deportivo, Barcelona have identified three top candidates to join the club in the summer and Marcus Rashford is named among them. It is thought now that Barcelona will begin to search for a Luis Suarez replacement with the Uruguayan striker showing signs this season that he will soon hit a decline. The Catalans don’t want to risk entering a new season with the former Liverpool man being their main option up front as that could leave them with egg on their face if he was to stop scoring suddenly. Tuesday’s edition of Mundo Deportivo, a Catalan-based news outlet, features Rashford on the front page, suggesting ‘Rashford on the agenda’. It turns out the United striker is an option for the Blaugrana alongside Eintracht Frankfurt’s Luka Jovic and Antoine Griezmann of Atletico Madrid who is also linked with a move to Old Trafford. 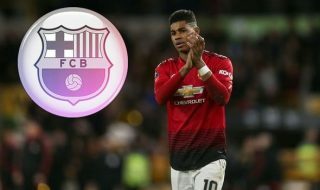 Rashford is yet to extend his current deal with United which expires in 2020 and Barcelona are said to be monitoring his contractual situation. The report fails to mention United’s option to trigger a one-year extension in the forward’s contract. Barcelona won’t find it easy to convince Rashford to quit Manchester United, but it is a concern that he and other players are yet to agree on fresh terms. This could become as much of a worry as Real Madrid’s non-stop interest in David de Gea. He looks happy at United with Ole Gunnar Solskjaer at the wheel, but his aim now as a footballer must become a 20+ goal a season striker.